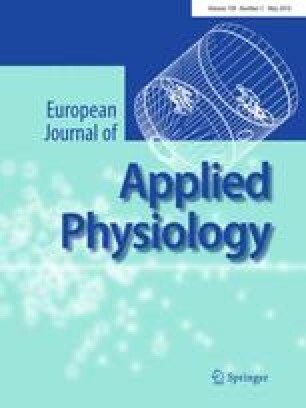 Measuring the DNA telomere length of skeletal muscle in experienced endurance runners may contribute to our understanding of the effects of chronic exposure to endurance exercise on skeletal muscle. This study compared the minimum terminal restriction fragment (TRF) length in the vastus lateralis muscle of 18 experienced endurance runners (mean age: 42 ± 7 years) to those of 19 sedentary individuals (mean age: 39 ± 10 years). The runners had covered almost 50,000 km in training and racing over 15 years. Minimum TRF lengths measured in the muscle of both groups were similar (P = 0.805) and within the normal range. Minimum TRF length in the runners, however, was inversely related to their years spent running (r = −0.63, P = 0.007) and hours spent training (r = −0.52, P = 0.035). Therefore, since exposure to endurance running may influence minimum TRF length, and by implication, the proliferative potential of the satellite cells, chronic endurance running may be seen as a stressor to skeletal muscle. Colin Sinclair-Smith passed away in September 2008. This study was supported in part by funds from the University of Cape Town, the South African Medical Research Council and the Association Français contre les Myopathies, AFLD, Inserm. Université Pierre et Marie Curie, EU NoE Myores and EU Network Myoage. Support was also provided through the following scholarships: University Scholarships Committee Award, Benfara Scholarship, Waddell Scholarship, KW Johnston Bequest Scholarship and the Marion Beatrice Waddell Scholarship.